After co-op ended in December 2008, I had one semester left before graduation. I decided to continue to build my resume by doing one last internship before leaving Boston. After walking at graduation, I hopped on a plane to Peru. Why? I had decided to spend a month volunteering with ProWorld. I got the travel bug during a three-week study abroad program in Brazil, and wanted to continue to travel while volunteering. I chose ProWorld because of their focus on working with local communities to keep projects running after volunteers left, and empowering citizens to focus on projects that would enhance their every day lives. During my month staying with a host family in Urumbamba, I taught children in an after-school program English and healthy environmental practices, took health surveys in communities, and built clean water filtration systems. I also was forced to speak Spanish, which helped my skills significantly. 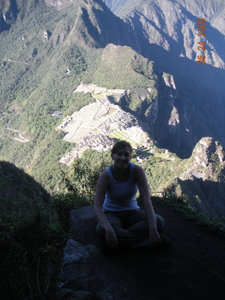 The program also included travel time and trips around the country, so I was thrilled to be able to visit Machu Picchu and other Incan ruins around the country. Alas, I had to come back to America eventually, and coming home meant moving in with the parents in New Jersey and job hunting all day every day. Wanting to continue my work in the new media world, I landed an internship at Next New Networks. The company produced online television networks, and was purchased by YouTube in 2011. My responsibilities during my four month internship included writing blog posts promoting new shows and networks, reaching out to YouTube channels to increase viewership, compiling industry researching, and helping in various way on video shoots. It was a really fun environment to work in, and gave me further writing experience – this time in the entertainment world. In between interning and job hunting, I was able to keep working and save money by temping. I kept my Microsoft Suite skills sharp at a finance company, had to pretend I had nice clothes while answering phones at Louis Vuitton, and updating contact lists at a nonprofit organization. Even though full-time work was scarce, I was able to temp consistently, and it really helped keep my skills sharp and boosted my resume. I also worked at Language Services, a company that translated documents between languages. I mainly proofread and formatted the documents to make sure they were easy to read and translated properly. This entry was posted in Internships and Temporary Positions. Bookmark the permalink.